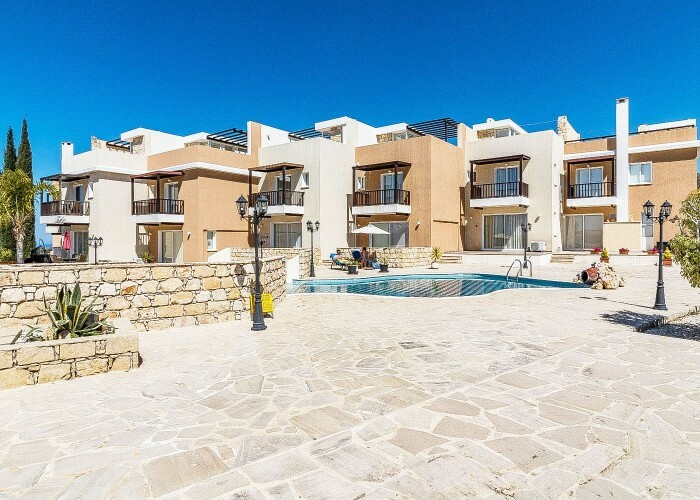 This high quality 2 bedroom townhouse complete with roof terrace is located in an exclusive development in Argaka is close to the beach and offers outstanding sea and mountain views. When approaching the house the first striking feature is the patio area immediately in front of the main entry door – ideal for enjoying an early morning cup of tea or coffee. Once through the front door we walk straight into the open plan lounge/kitchen/diner . The well equipped kitchen is to the left and features include, a washing machine, microwave oven, fridge and freezer as well as a conventional oven and hob. All of these are included in the asking price. The generously sized lounge has 2 settees, one a 2 seater and the other a 3 seater as well as a classy looking chandelier with a cluster of 5 bulbs and a flat screen TV and DVD player. A glass topped coffee table is also included. The diner includes a dining table large enough to seat 6 people comfortably and patio doors lead from this room to the attractive rear patio. For the dedicated sun worshipper it is an ideal place to sunbathe. The patio is surrounded by tasteful shrubs and potted plants, with an automatic irrigation system. A guest cloakroom completes the rooms on the ground floor. The two bedrooms are on the first floor. Both are doubles and both have their own private balconies. The master offers stunning mountain views, plenty of wardrobe space and an en suite bathroom complete with overhead shower, sink and W.C. The second bedroom has the same features as the master but has an en suite shower room rather than a bathroom. A further staircase leads to the roof terrace and it is from here that the stunning sea and mountain views can best be enjoyed. Just imagine sitting here either first thing in the morning or in the evening taking advantage of the Mediterranean lifestyle. The lucky owner of this property also has the choice of two large communal pools in which they can immerse themselves for extra relaxation. Argaka is a 10 minute drive from the traditional market own of Polis on the north west coast of southern Cyprus and 15 minutes drive from the upmarket marina of Latchi with its crystal clear water and exciting water sports. The Akamas national park is 5 minutes drive further on. Argaka is situated on the edge of the Chrysocou Bay and therefore has a large beachfront, and a number of restaurants situated near or on the beach. Argaka probably enjoyed the best sunsets in the whole of Cyprus.